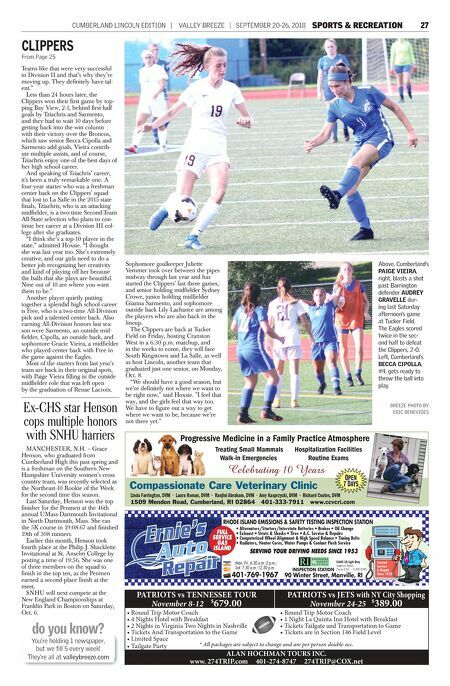 26 SEPTEMBER 20-26, 2018 | VALLEY BREEZE | CUMBERLAND LINCOLN EDITION Good Luck Lincoln Girls Soccer Half Day Programs 9 a.m. - 1:30 p.m. 401-333-0303 55 Woodland St., Lincoln, RI 02865 www.handinhandcp.com 2084 Diamond Hill Rd. Cumberland, RI 401-333-2651 179 Front St., Lincoln, RI 401-728-3990 290 County St., Attleboro, MA 508-222-0719 $ 1 .99 Only one offer per coupon. Valid at the following locations: Diamond Hill Rd., Cumberland, Front St., Lincoln and County St., Attleboro. Plus tax. Cannot be combined with any other offer. No copies. Shop must retain coupon. Medium Cold Brew Mocha GO LIONS! Front row from left are Emily Ariza, Minnie DaCosta, Amanda Conti, Sadie Oliver, Melody Chhem, Jenna Iaciofano, Sarah Leonetti, and Tayla Salome. Second row from left are Abby Gill, Regan Derenthal, Lucy Kratman, Madison Picard, Shaili Sullivan, Amy Stevens, Julia Perry, Kayla Kumar, and Hayley Chartier. Rear from left are Serena Tuytschaevers, Lynsey Fleming, Samantha Jarry (Capt. ), Lily Loparto (Capt. ), Morgan Soares, Jackie Andrews, Riley Soares (Capt. ), Lydia Denio, Sadie LaFleur (Capt. ), Sarah Fellingham, Kirstin Drainville, and Coach Chris Allen. Missing is Coach Graham Souness. 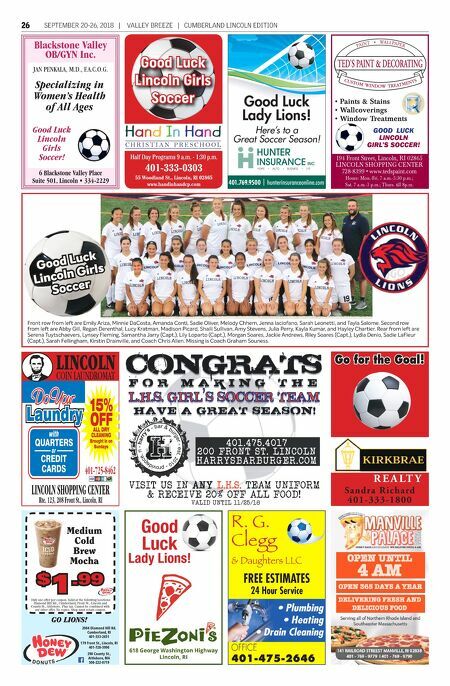 Good Luck Lincoln Girls Soccer R. G. Clegg & Daughters LLC FREE ESTIMATES 24 Hour Service • Plumbing • Heating • Drain Cleaning OFFICE 401-475-2646 LINCOLN SHOPPING CENTER Rte. 123, 208 Front St., Lincoln, RI LINCOLN COIN LAUNDROMAT 15% OFF 401-725-8462 ALL DRY CLEANING Brought in on Sundays Good Luck Lincoln Girls Soccer! Blackstone Valley OB/GYN Inc. JAN PENKALA, M.D., F.A.C.O.G. 6 Blackstone Valley Place Suite 501, Lincoln • 334-2229 Specializing in Women's Health of All Ages 194 Front Street, Lincoln, RI 02865 LINCOLN SHOPPING CENTER 728-8399 • www.tedspaint.com Hours: Mon.-Fri. 7 a.m.-5:30 p.m.; Sat. 7 a.m.-3 p.m.; Thurs. till 8p.m. • Paints & Stains • Wallcoverings • Window Treatments GOOD LUCK LINCOLN GIRL'S SOCCER! Go for the Goal! R E A LT Y Sa n d r a R i c h a rd 4 0 1 - 3 3 3 - 1 8 0 0 Good Luck Lady Lions! Here's to a Great Soccer Season! Good Luck Lady Lions!